Print visa issued via sms or Check your exit re-entry and final exit Saudi Arabia visa validity and expiry date online with the help of muqeem online service from the ELM by using following link. - Choose one of your preferred option from the available options IQAMA NUMBER or VISA NUMBER or PASSPORT NUMBER. - Choose one of the available options from IQAMA NUMBER or VISA NUMBER or PASSPORT NUMBER or NAME or DATE OF BIRTH or IQAMA EXPIRY DATE or VISA EXPIRY DATE except the one you already entered above. 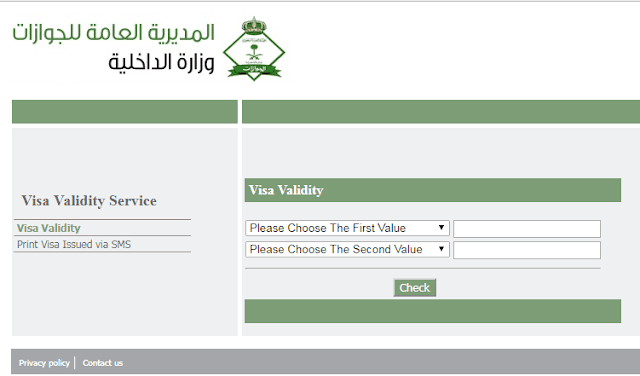 - NO NEED TO Select your Nationality or country, Leave it as it is. 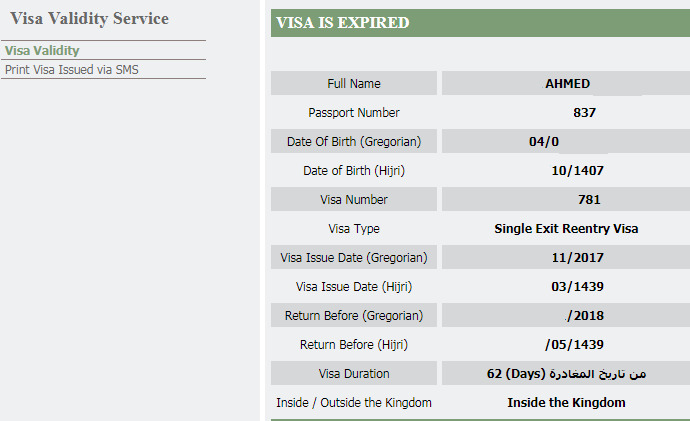 How to check my exit re entry visa through MOI? 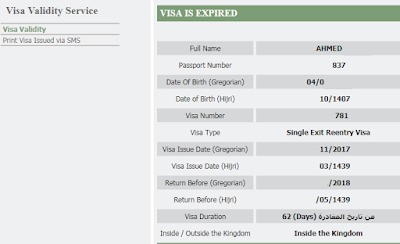 Now you can see your inquired Exit re-entry visa including visa type, expiry date and other details. Expatriates who went on exit re-entry and failed to return to Saudi Arabia will be banned for 3 years from re-entering into Saudi Arabia. Read this article Possible ways for coming back to Saudi Arabia after expiration of exit re entry visa.